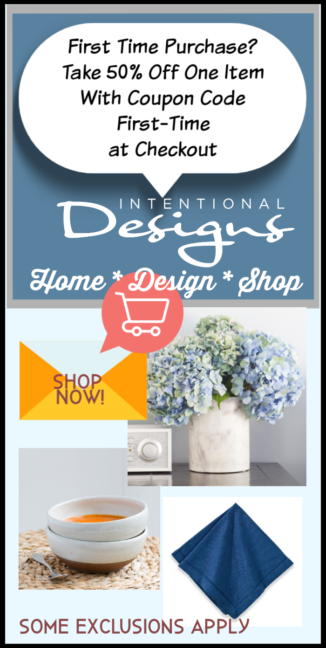 You are here: Home / Home Decorating Ideas by Room / Seasonal Decorating / Fall Porch Decorating, 5 Quick Tips! 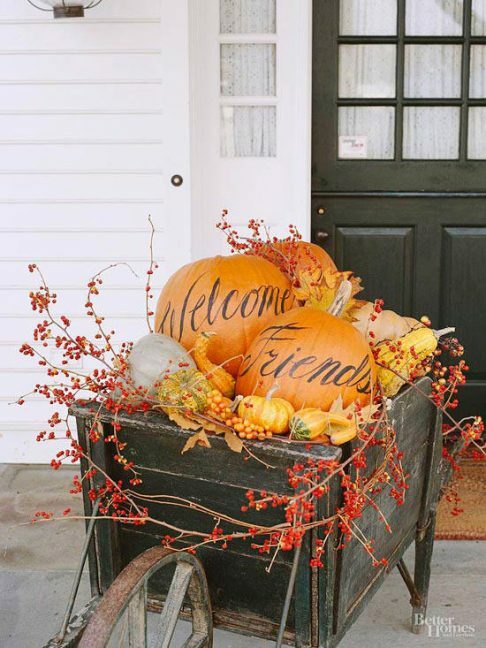 Fall Porch Decorating ideas that are inspiring us! Because it’s never to early to gear up for Fall holidays, especially Halloween and Thanksgiving. 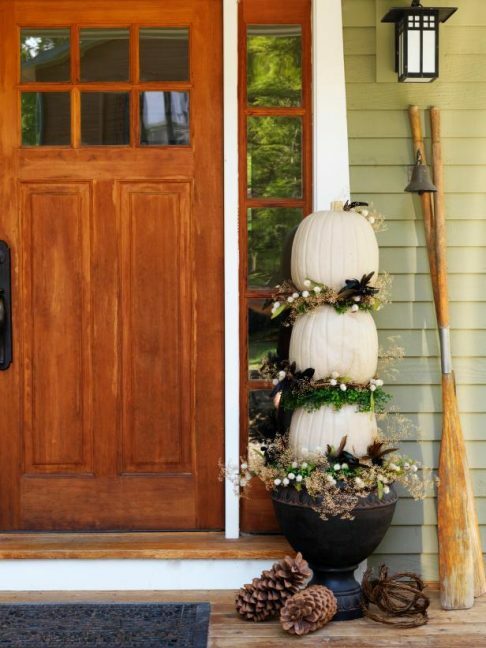 And we’ve rounded up 5 simple DIY ideas to make your curb appeal Fall ready. 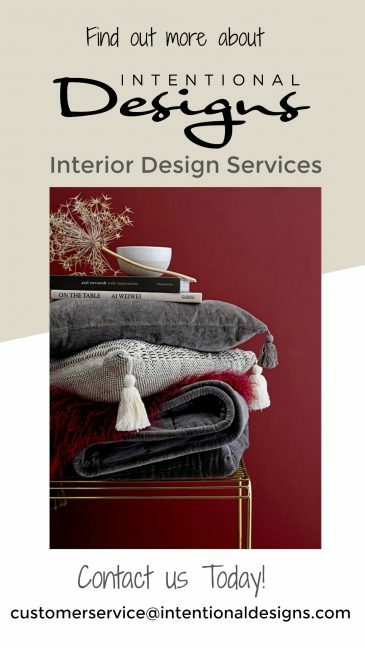 With this in mind, we’re looking at symmetry, focal points, products, color and composition just as you would in any room of your home. 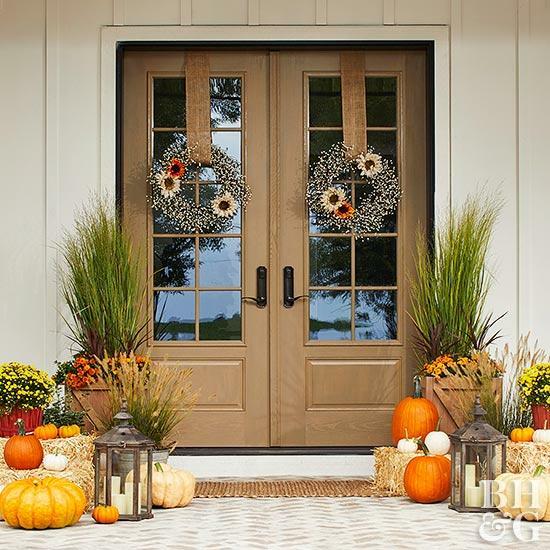 So Just for Fun, we’re taking a look at 5 Fabulous Fall Porch Decorating Ideas! First, think symmetry. And if you have a large front porch the idea of symmetry works well to balance your space. So while your shopping, buy 2 sets of everything and a few extra pieces. Because there is freedom within the design by keeping the proportions as close as possible. Just play around with it to get the balance right. Second, create a focal point. With a beautiful wheelbarrow such as this one, your work is halfway done! Equally important though is what you fill it with like these cute calligraphy pumpkins, bittersweet vines, and gourds. Third, what you see may not be the real thing! 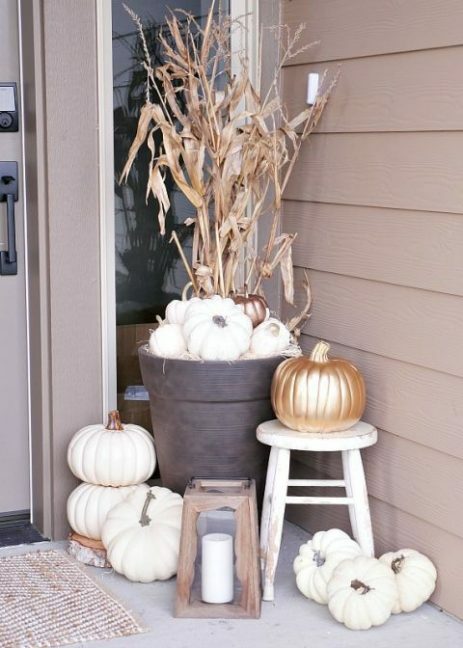 Ever wondered how to stack pumpkins like this? 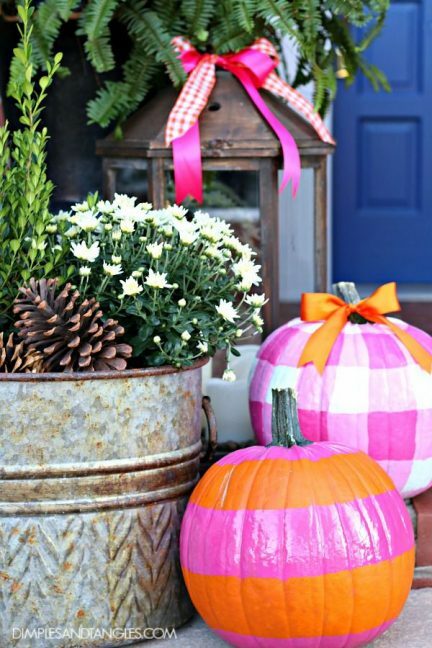 Well, they are from the craft store, a great DIY Fall Porch Decorating Project. Fourth, think outside of the box. 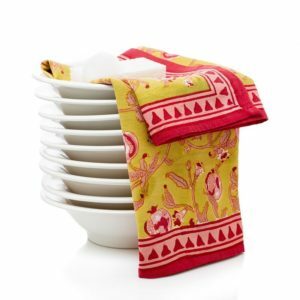 While pink is not usually thought of as a fall color, no worries it can be your Fall color! Lastly, vary heights. In like manner of a table setting, floral arrangement or a vignette in your home. Staggering heights creates interest and actually highlights each element of the design. « 6 Sensational Barn Doors!